In my work with districts, service agencies, and states, I have seen direct impact on professional learning. District leaders are empowering teachers in this process and giving them the agency to make decisions based on their students’ needs. Teachers are owning this process and engaging in rich conversations about standards, instructional materials, and pedagogy. There are some significant changes happening in professional learning across this country that might never have happened without OER. When I first started this work, I primarily focused on campaigning about how OER could replace textbooks and that we needed more people joining the community to lighten the lift. While this still serves as an entry point for some conversations, I try to talk more holistically about teaching and learning because OER can be a catalyst for larger conversations. We have new standards, infrastructure, and devices in our classrooms, yet there are still so many teacher-centered classrooms where textbooks remain the driver. Is that what we want in 2018? Do we want to continue with the status quo? We can use big questions about what we want teaching and learning to look like and how instructional materials play a role in helping us move forward. I value the community that has developed around PreK-12 OER. This network of districts, service agencies, states, and even individual teachers is unlike any other group of which I’ve been a part. Everyone is incredibly supportive and willing to share not only resources, but also lessons learned and best practices. I can reach out to community members at any given time and get answers directly from practitioners doing the work. This is a grassroots movement that continues to grow because of the community that is building it. I wish people understood that OER is more than just the resources. It is a mindset. It is a shift in practice. Teachers that search and discover, curate, implement, and iterate, are more open to involving their students in the same kind of process. This is when the shift occurs and our practice becomes open. Kristina Ishmael is a Public Interest Technology Fellow at New America. She is collaborating with the Education Policy program to support states and districts using Open Educational Resources (OER) to transform teaching and learning. Previously, she was the K-12 Open Education Fellow at the Office of Educational Technology, where she developed and grew the #GoOpen movement. 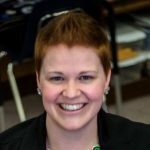 Prior to her work at the U.S. Department of Education, she worked as the Digital Learning Specialist for the Nebraska Department of Education where she collaborated with 245 public school districts and 17 Educational Service Units, led professional learning, and advocated for school libraries. This experience granted her a unique perspective on deploying educational technology to provide equitable access and opportunities in urban, suburban, and rural school systems. Before her role with the state, Kristina was a teacher to high risk elementary ELL students in Ralston Public Schools and a second grade and kindergarten teacher in Omaha Public Schools.